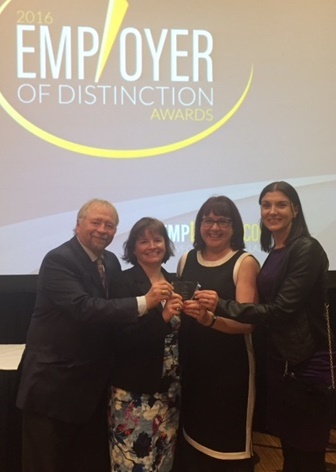 Board Chair Stephen Jewczyk, CEO Lisa Browne, Director of Corporate Services Michelle Dyke and HR Specialist Kimberly Hebb at the Employer of Distinction Award ceremony. Stella’s Circle was thrilled recently to receive a Path to Distinction Award from the NL Employers Council. The name of the award is perfect. It really is a path to travel on in order to be focused on leadership, innovation and valuing our workforce. Over the past two years, Stella’s Circle has really focused on its workforce. We are caring for others so it’s important that we care for ourselves and each other. And we like to think that we’re innovative when we do it. For example, our Just For the Health of It Committee held a wellness fair. We encouraged employees to show their fellow employees what they do for wellness. During the fair, we had people demonstrate their cooking skills, play music, show their crafting skills, etc. 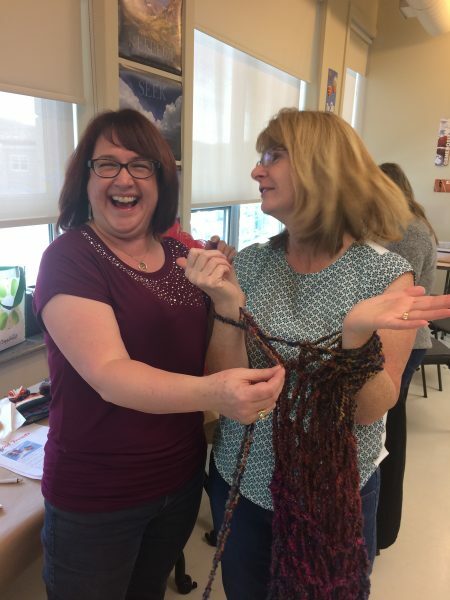 It was a fun way to get to know our colleagues in a different light while also emphasizing the importance of doing activities that you enjoy. We have also had our management group trained in the Mental Health Commission of Canada’s Opening Minds program which focuses on mental health in the workplace. And we have such talented employees, we’ve been fortunate to enjoy lunchtime yoga sessions offered by staff as well as a lunchtime Learn to Run program. In addition to our focus on wellness, we have seen great results in our emphasis on safety. The rebates from our Prime audits demonstrate our success. A workforce culture that is safe and happy is a very productive workforce. We’re delighted to have our efforts recognized! Michelle, Director of Corporate Services, teaches Karen, Director of Property Development how to arm knit.